Summary (from the back of the book): Fourteen-year-old March Wong knows everything there is to know about trees. They are his passion and his obsession, even after his recent falls--and despite the state's threat to take him away from his mother if she can't keep him from getting hurt. But the young autistic boy cannot resist the captivating pull of Pacific Northwest's lush forests just outside his back door. One day, March is devastated to learn that the Eagle Tree--a monolithic Ponderosa Pine near his home in Olympia--is slated to be cut down by developers. Now, he will do anything in his power to save this beloved tree, including enlisting unlikely support from relatives, classmates, and even his bitter neighbor. In taking a stand, March will come face-to-face with a frightening possibility: Even if he manages to save the Eagle Tree, is he risking himself and his mother to do it? Review: Trees. There is a lot about trees in this book. Probably a bit too much, but that is the mind of March Wong and who am I to complain about that? The author has really captured the thoughts and speech and obsessions of this autistic character very well. March is tunnel-visioned about trees and climbing trees. 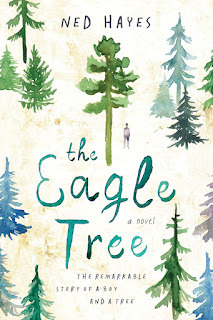 How great that he can put his knowledge and passion to work to save the Eagle Tree. I had to take a break in the middle of reading this book because I did get overwhelmed with the trees. Imagine how March's mother (and by that I mean real moms and dads with autistic children who have interests that equal March's) feels hearing about them every day, all day. And she has to worry that he will hurt himself when he climbs them. She learns that she can have some control over the climbing by setting rules: how long he can stay in one tree, how many trees he can climb each day, etc. March understands rules that are precise and seems to use them to know how to behave in the larger society. There is a nice rhythm to this book based on the cadence of March's thoughts and speech. I also liked the environmental message and the way it treated March and his autism.